Sharp Creek Campground is located just 1/2 mile east of Christopher Creek. 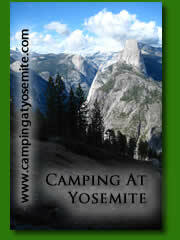 The campground is in almost perfect condition and is spread out over quite a bit of land. The roads are paved and there is a little shade. Sharp Creek campsites have a unique feature at each campsite. There is a lantern holder as seen in the picture above. Fishing is only 10 minutes away at either Woods Canyon Lake or Willow Springs Lake. Sharp Creek has three large group sites. There is a dump station available at Ponderosa Campground. 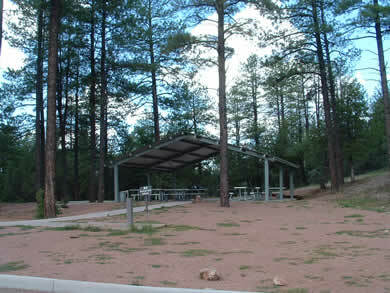 Campsite Panoramas - See each campsite at Sharp Creek Campground. From Payson, head east on S.R. 260 until you just pass the town of Christopher Creek. The campground entrance is on your right. Above: the group ramada and facilities which are separate from the main camp area.